The General Assembly elected Peter Thomson, Permanent Representative of the Republic of Fiji to the United Nations, as President of the Assembly’s seventy-first session. The election was conducted by secret balloting, with Mr. Thomson earning 94 votes, while the second candidate, Andreas Mavroyiannis, former Deputy Minister for European Affairs of Cyprus, earned 90 votes. 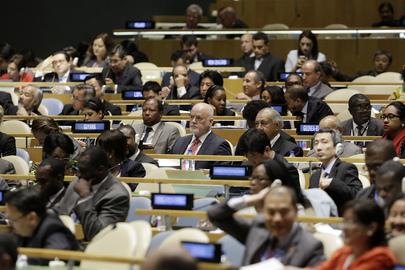 Mr. Thomson (centre) with his country’s delegation on the floor of the General Assembly Hall during the election.